Based in Ft. Lauderdale, Paws South Florida Rescue is an animal-welfare group working to put an end to the damaging cycle of feline overpopulation in their metropolitan area. And, they are one of our ‘returning champions’, receiving our non-profit’s support for the last three consecutive years. This post definitely falls in the ‘back to the future’ category, as it was last January when we updated you on the second award (in 2012) to this outstanding organization. Continuing their momentum, their 2013 grant application once again appealed to the hearts and minds of our non-profit board members. 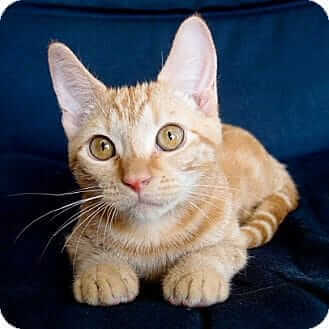 Our long-term backing of this organization is due to their consistent performance in delivering dependable results for local feral felines as well as cats in their foster care network. Their workers embody the very spirit of can-do rescue attitude. Taking the long view in what amounts to one crisis situation after another is challenging, but it’s exactly what this committed rescue has done. Feline overpopulation isn’t a problem that can be solved in a day. But, with grit and determination, they are making significant progress towards what they think is a very real goal. It would seem that the unofficial motto of this rescue is to ‘keep putting one paw in front of the other.’ Every day begins with laying the groundwork for future successes. And they represent the best chance Ft. Lauderdale feral felines have for being free from abuse, disease, hunger and living at the mercy of the elements. The grant we provided last year went toward helping Paws South Florida Rescue achieve their latest ambitious goal. Our grant helped Paws launch a new project – the reduction in the number of cats sent to languish in the county’s municipal shelters. Given its relatively small human population, the nearby city’s impound numbers were ‘very high’. Thus far, they haven't encountered any unexpected challenges or obstacles. This is just another example of the group’s coordinated efforts at identifying problem areas and actively pursuing the solution, even though the project is estimated to take nearly two years to complete. It’s clear that when Paws South Florida Rescue undertakes a new cause, they are completely dedicated to seeing it through. • 2013 proved a solid year for locating forever homes for cats, with 23 finalized adoptions. 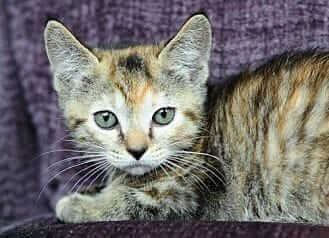 • They also successfully transferred 10 other cats (mostly kittens) to another local rescue group. This particular shelter had the right resources at the right time, and helped to find homes for the kittens. This minimal reduction in the number of cats alleviated some of the stress on the whole foster network. As an unnamed volunteer approached his car, he observed a cat hiding under an adjacent vehicle. Able to coax the feline out from her ‘safe spot’, the volunteer made inquiries among nearby condo-maintenance workers. He quickly discovered that the cat was one of many animals living with squatters. Determined to return the kitty safely home, he approached the squatters … but they expressed no interest in the cat. This lucky kitty was now going home with the dedicated rescue worker! A few short weeks later, the volunteer learned that not only had the squatters been evicted from the condo, they had been hoarding animals ... and had left some behind. Suddenly, our hero found himself the only thing standing between four more abandoned cats and an uncertain future at the local pound. According to Paws President Deborah Gagnon, “Every one of these cats has proven to be extremely friendly”. She added, “All of them have now been properly re-homed with personal friends and acquaintances of our volunteer who took it upon himself to work this personal project.” By all accounts, these felines are welcome adoptees, and all have proven to be “true lap-cats”. 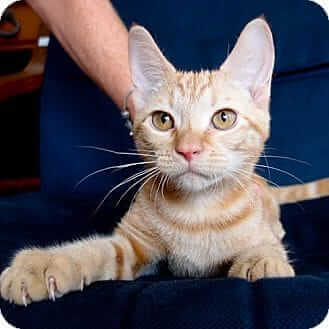 A rare, orange, female tiger kitten, Tanji is openly friendly and playful with cats and humans. Cuddles loves to play – especially pounce-on-the-foot – and likes to smooch whoever’s holding him. A dark-orange tiger kitten, Ruby is described as ‘exceptionally affectionate and playful’. Dr. Jane’s HealthyPetNet Foundation has provided funding to animal rescue groups all over America since 2007. Our non-profit wing could not have achieved what it has without the continued patronage of our customers and contributions of individual donors. On behalf of Tabitha, Biff, Tanji, Cuddles, Ruby, Molly, Mr. Snuggles, as well as dozens more, we thank you for caring enough to make a difference. If you’ve had experience with an animal rescue organization worthy of special recognition and financial support, please forward this post, to let them know that our non-profit is actively seeking grant applications for 2014. We encourage interested parties to call us toll-free at 877-387-4564 … one of our customer service agents will be happy to share application details.